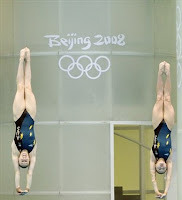 On the 12th of August, Melissa Wu and I competed in the Women’s 10m platform Synchro. 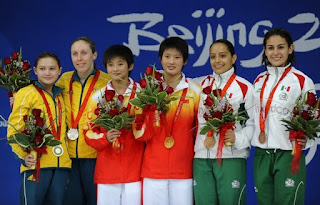 There were 8 countries competing – Australia, Canada, China, DPR Korea, Germany, Great Britain, Mexico, USA. Melissa and I were the last pair to dive. 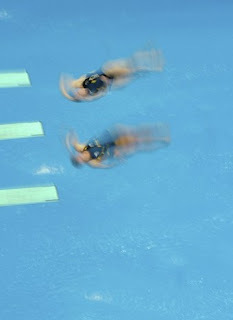 Melissa and i had a great event, not really missing a dive and always having great synchro. We finished in second place behind the Chinese, who won with 363.54 points, we scored 335.16, and Mexico was in 3rd place with 330.06 points. I had a great time competing, it was fun not to mention nerve-wracking. After the medal ceremony we had lots of media, then it was off to the press conference. Lastly I had to do a drug test. 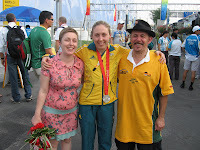 Once that was all done i was able to catch up with my dad Wayne and big sister Sian out the front of the Water Cube. 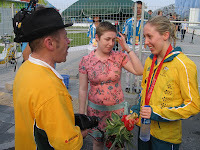 On the 10th of August, Sharleen Stratton and I competed in the Women’s 3m Synchro. There were 8 countries competing – Australia, China, Germany, Great Britain, Italy, Russia, USA and Ukraine. 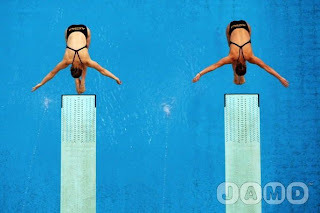 It was the first diving event of the Olympics, and Sharleen and I were team number 1. We dove pretty well, not missing a dive, unfortunately we finishing in 5th place. First was China, then Russia in second, Germany in third then USA. There were only a few points separating 3rd to 5th so that was frustrating and disappointing. At arrived in Beijing on the 4th of August, it was great to finally be there after a very long build up. We got into the village at 1:30am, and it was straight off to bed. The Aussies are living in building D8, and us divers are on the 6th floor, some how I got a room to myself which was lucky. The Village was awesome, it looked great, and there was so much to do. The next day we caught the bus to get our uniforms, it was like Christmas morning - only better. We got lots and lots of uniform which all looks fantastic! We all couldn't wait to go through it all and try it all on. We also got plently of suitcases and bags to take it all home in. The dining hall at the village is a sight to behold. It even has a map out the front, cause it really is that big! The dining hall had everything, you name it, they had it. There was even a Mc Donalds, and everything is free! On the 6th of August we all went out to the Main Press Centre to have our press conference, I did a few interviews which was fun! 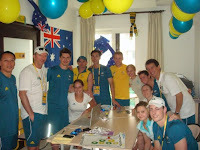 In our apartment we had the five diving girls: Sharleen, Alex, Mel, Chantelle and me, also in our apartment was Australia'a only Penthathlete Angie Darby. We thought it would be nice to decorate our room, espeically as we had lovely art work from primary school students back in Australia. Today I’m off to Beijing along with the rest of the Australian Diving team. 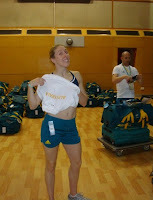 I can’t wait to get over to Beijing, move into the Olympic village, get my Australian Uniform and get into the Olympic atmosphere. As this is my first Olympics, as you can imagine I’m super excited and also quite nervous. There have been so many messages from people wishing me all the best, which has been awesome. Last Friday I received my accreditation, which is very important, as it lets me into the Village, the sport venues and the dining hall. I also received my first piece of uniform which is the travel top. The Olympics are starting to feel real now. My Olympic program is on the 10th of August I’ll compete in the Women's 3m Synchronised with Sharleen Stratton at 1:30pm Beijing time (or 3:30pm Eastern Standard time), my next event is on the 12th of August it’s the Women's 10m Synchronised with Melissa Wu, again it’s on at 1:30pm Beijing time (or 3:30pm Eastern Standard time). Then I’m all done competing and be able to let my hair down a little and hopefully I will be able to enjoy the Olympic experience.